SEOUL, Aug. 14 (Yonhap) -- North Korea has repeated its call for the declaration of the end of the Korean War through its external propaganda media this week, saying mutual trust is necessary to make progress in its denuclearization, as well as in its relations with the United States. The North's weekly propaganda publication Tongil Shinbo said that further progress in its denuclearization cannot be expected if the U.S. fails to take phased and simultaneous actions, like an end-of-war declaration, to build mutual trust. 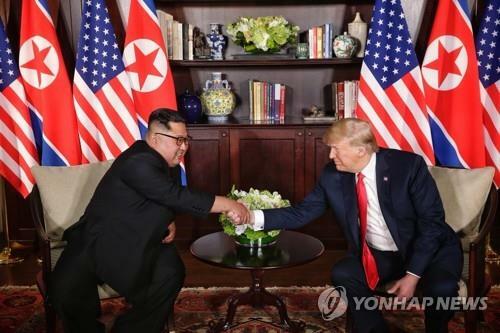 "The U.S., as a responsible party in the declaration of the end of the war to establish permanent peace on the Korean Peninsula, should take practical measures to implement the agreement of the June 12 North-U.S. summit in Singapore," the weekly said in a commentary published Monday. The newspaper then warned South Korea not to "blindly" follow foreign countries' anti-North policy, saying that sanctions and an improvement in their relationship are absolutely incompatible. "A smooth development of the inter-Korean relations cannot be expected if the South blindly follows foreign forces' policy of hostility towards the North," it said. "There has been a breakthrough in the North's relations with the South and the U.S., but the termination of the war on the Korean Peninsula still remains an unresolved task." In a similar argument, Pyongyang's propaganda website Meari said that building mutual trust is critical to revitalizing the stalled North-U.S. dialogue. "The slow progress in the North-U.S. dialogue has been caused by unilateral demands and hostility from the U.S.," the website said.